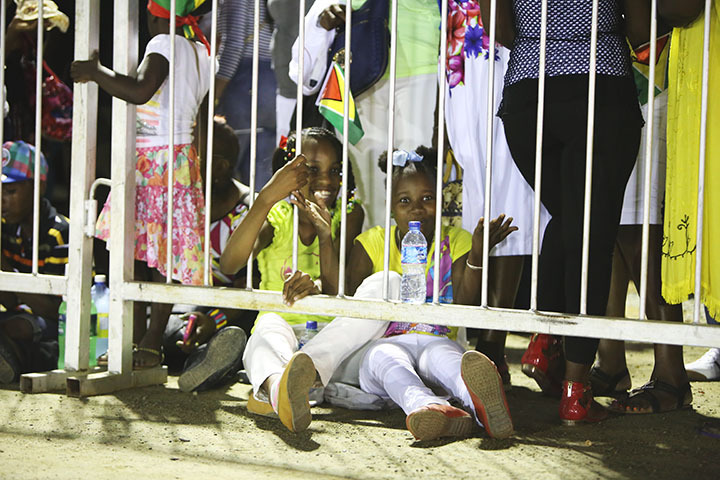 While thousands enjoyed the spectacle of Guyana’s 50th Independence Anniversary celebrations at D’Urban Park on Wednesday night, there were logistical challenges and many persons were left standing throughout the lengthy programme. As thousands, including returning Guyanese and visitors, packed the D’Urban Park stands and its environs for the flag raising ceremony many were forced to stand and there were no special provisions for differently-abled persons. While the 30 stands were to fit approximately 20,000 persons, the quota was quickly filled after the crowd poured in from as early as 4pm. “I came all the way from Connecticut (USA) so I could be a part of this celebration and this is what is happening. No seats, we are forced to stand and they are reserving spots for people that can’t even reach here. Shouldn’t it be a first come, first serve basis? People here waiting and coming out early and we can’t sit,” Benjamin (only name give) explained to Stabroek News on Wednesday night after he, and a large group of persons, both foreign and local, were blocked from entering one of the stands which was reserved for ex GDF officers. In addition to that stand, six others were reserved for the performers. Two children enjoying their seats on the ground as the stands could not accommodate them. While some of the persons resigned themselves to standing, others were angry and voiced their opinions. One woman, who traveled from Region 7, said she believed that the Guyana National Stadium at Providence would’ve been more suited to the flag-raising. “I had to spend me passage and come till here just to get treat like this? They got empty stands here and they blocking people off, they got all these lil children standing here while these stands empty,” the woman said, stating that she was frustrated and regretted coming for the celebrations. Another woman E. Browne, who said she came all the way from London (UK), pointed out that her feet were swollen from all the standing but she was enjoying the celebrations nevertheless. “You only get to 50 once and regardless of me having to stand and endure all this pain I am still happy to be here and enjoying the atmosphere. It’s pretty patriotic with all the people singing together, you know, there’s a unity vibe and you don’t see this kind of thing every day and it’s just really good,” she said, stating that she is looking forward for the next 50 years and hopes that the unity and cohesiveness that was displayed throughout the evening would be portrayed in the coming years as it was key to Guyana moving forward. The frustrations did not hinder persons from celebrating as they chanted, waved their flags and enjoyed the late night atmosphere with their family and friends. While some of them were garbed in all of the colours of the Golden Arrowhead, others were decked out in the solid colours. As folks songs echoed through the park, the crowd sang along. While the celebrations saw both able and disabled persons, the differently-abled were left with feelings of discomfort as systems were not put in place to accommodate them. A person who accompanied his relative who was wheelchair-bound complained to Stabroek News about the lack of appropriate facilities. Because some of the stands were reserved, persons had to walk all the way around the park to access the ones that had not been filled as yet and were not allowed to walk across the field. “Look, she’s in a wheelchair and to have to push that through that area. It would be tough and would be easier to just go across the park,” the man pointed out, stating that he was disappointed that systems were not put in place to accommodate them. “Firstly, how are they [disabled persons] supposed to use the stands? You can’t take them out of their wheelchairs and put them there and there aren’t anything in place to get their wheelchairs up the stands or anywhere on high ground,” the man pointed out, stating that even if the persons were to be where the crowd was standing, if they had not gotten a space in front they would not have been able to get a glimpse of the celebration. He said that since it’s the Golden Jubilee celebrations, systems should have been put in place to accommodate them since it was expected that Guyanese of all races, gender, creed and abilities would be able to participate. Another differently-able person was disappointed that the police officers did not permit her to cross the tarmac to get to the other stands. She explained that it would’ve been extremely difficult for her to move her wheelchair past the already filled stands, through the rough terrain, when she could’ve just crossed the VIP parking lot to access the stands on the northern side. In addition to the lack of seating and lack of systems for the differently-abled, persons were also frustrated with the route to access the stands. Persons were only allowed to enter through the entrance at Hadfield Street and Homestretch Avenue. “I walk all the way around and they tell me to go right back around and now I getting tell to go back around again. It don’t mek sense, people got old people and children with them and they gotto do all this walking,” James (only name given) said, suggesting that more entrances should’ve been available. The seven reserved stands were in different areas and James said that the planning committee should’ve placed all the stands together. “It would’ve caused less confusion if they just had all reserved stands in one place and had the entrances all around”, he said. In addition, ushers were not evident in some areas and this resulted in special guests and performers being unaware of where they were supposed to be seated. As the crowd grew larger by the hour, the areas that were cordoned off to keep the crowd away from the tarmac were packed tightly. Children and even adults were seen squeezed through the barriers and sitting on the ground. Eventually the crowd, that seemed to have grown exponentially, broke through the barrier and flooded the tarmac. Persons squeezed themselves into the already packed stands and even climbed onto the media- reserved bleachers to get a glimpse of the performances and the hoisting of the giant Golden Arrowhead. The sound system was not audible to persons in all of the stands and those lower down in the stands could hardly see as there were persons standing in front of them. The emergency responders were also busy as around seven persons had to be escorted out on stretchers.